Covering everything from Historic Hidden Gems and VIP Spaces to the Majestic Wonders of the World be it Natural Formations or Man-Made, we hope to give you a glimpse of the awe-inspiring environments that help shape the different cultures and traditions around the world be it past, present or future. So pack your bags, and Travel Around the World with us! Wedding of my dreams! Nov. 6, 2015 @ Four Seasons Resort. Koh Samui, Thailand. So lucky to be able to spend the rest of my life with my best friend! For those of us who live in Asia, travelling to South America cannot happen very often as it’s just too far of a distance to travel. Bearing that in mind, I’ve decided to continue posting about Bolivia while the experiences are still fresh in my memory so I can more accurately, share them with you. Another legendary place I’ve heard about since taking Spanish classes in Middle School is Lake Titicaca, Birthplace of the God of the Sun and the Incas. I first embarked on our trip to Titicaca thinking that we’d be visiting the famous Floating Reed Islands. Turns out, those Islands are located on the Peruvian side of Titicaca and since we were on the Bolivian side, we did not get to see them. However, “La Isla Del Sol” or Island of the Sun and “La Isla Del Luna”, Island of the Moon were both closer to the Bolivian docks and so, we focused our journey here instead. “La Isla Del Sol” was believed by the Incas to be the birthplace of the God of the Sun. It’s a remarkably large island located in the middle of a remarkably large lake. To get from village to village, a boat is your best and only option besides hiking over the mountain peaks. On either end of the island are Temples built by the Tiahuanaco people, who ruled before the Incas. (Technically, the term “Inca” can only be used to refer to the King, though nowadays, we use “Inca” to refer to the strongest High Plateau civilization, the Quechua) The Temple of the Sunrise was built to greet the Rising Sun in the East, and the Temple of Sunset was built to bid farewell to the Setting Sun in the West. Each temple is built as a mini labyrinth that consists of different passageways and chambers for priests to perform different rites and rituals. Judging from the short openings of the doorways (Some only measure 4.5’ tall), I assume that the Tiahuanaco who built these Temples some 1000 years ago were physically much smaller than we are now today. Around these religious sites are stone towers stacked by visitors for it’s believed that the higher you are able to stack your stone tower, the closer to the Sun God you are in Spirit. Despite the number of tourists (mostly young backpackers), most natives still live a very traditional lifestyle where their main income is farming. The entire Isla Del Sol is covered in Terraces for High Altitude Crops that include Quinoa, Lima Beans, Maize, Snow Peas, and Local Sweet Potatoes. These Terraces remind me of the Rice and Tea Terraces of Vietnam and China. Like Santorini and other Greek Islands, the natives who live on Isla Del Sol use Donkeys and Mules to transport all goods to the higher slopes of the island via steep stone pathways, as there isn’t a single car or buggy on the Island. Living in a city like Hong Kong, I almost never see clear blue skies or lush greenery. I don’t know if it’s the high altitude and/or the lack of pollution in Titicaca that makes the waters blue-er and the grass greener, but I was so happy to finally see a thick carpet of grass again! In fact, the hummingbirds in Titicaca are literally FOUR times the size of hummingbirds we see in the United States. They’re bigger than the city sparrows in Hong Kong! The natives say it’s the high altitude and I think I believe them. Standing on the cliffs of La Isla Del Sol and looking out at Lake Titicaca brings an unexplainable type of peace for those of us who come from highly populated cities. You don’t need to close your eyes to concentrate on the sounds of nature that surround you. It’s already so silent. Everywhere, you can hear the wind blowing, birds chirping, perhaps, even the hum of a hummingbird’s fluttering wings. Then as you look out on to the blue waters, the stillness of the lake surface is only occasionally broken by the arrival of a tour boat, which doesn’t happen very often. Hope you can spot the hummingbird! Salar de Uyuni, the world’s biggest natural mirror is something of a legend for world travelers. Ten times the size of Hong Kong at an altitude of 3650 meters above sea level, The Salar is the world’s largest salt flat and up until three weeks ago, was at the top of my travel bucket list. I’ve dreamt of going to this place since I first heard about it in 2009 and was finally able to this Chinese New Year Break. It wasn’t easy getting there. 32 hours of flight time, 5 airport layovers, a lot of jetlag and 4200 meters in altitude later, we finally arrived in Bolivia and Uyuni! The city of Uyuni was meant to be Bolivia’s version of what Buenos Aires is to Argentina, what Paris is to France. Instead, we stepped into a deserted mining town that resembles a bad production of an Old Hollywood Western. Crumbling Brick and Mortar buildings, apartments with holes for windows, plastic sheet roofs, stray dogs, swirling dust…you get the picture. It was so easy to imagine tumbleweeds blowing through the one and only Main Street. Luckily, we were only here for a short breakfast while our guide arranged the supplies required for our stay in the Tayka Desert / Salar de Uyuni for the next 3 nights. Uyuni and the adjacent Tayka Desert are like night and day. While Uyuni is a dead mining town, the Tayka Desert boasts some of the most majestic scenery I’ve ever seen in my life. Words cannot begin to describe how astonishing some of these sites are. We spent two days in a jeep riding on bumpy roads (if you can even call them that) visiting the different sites. It was a very humbling experience for I’ve never felt so small compared to the vast and seemingly endless terrain. In fact, the desert is so big we rarely saw other visitors except for the occasional llamas and flocks of flamingoes. How our driver was able to navigate where we were going without a GPS still befuddles me. 1) Stone Valley, Entrance to the Tayka Desert. 2) Laguna Primero. 3A) 1500 Yr. Old Medicinal Yurata. 3B) Sulfur Geysers at 4900 Meters Above Sea Level. Walk at Your Own Risk. 4) Beautiful Colors of the Tayka. 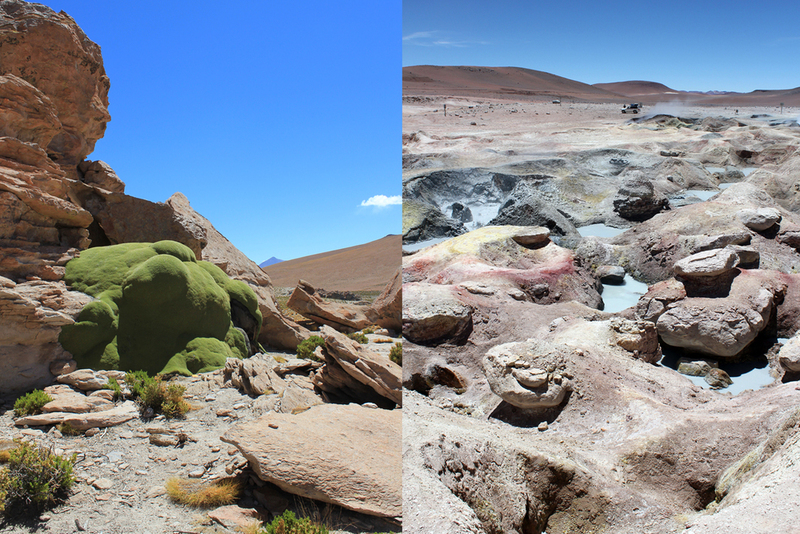 5) Laguna Colorada at Noontime. 6) Laguna Colorada and its Resident Flamingoes. 7) Beautiful Colors of the Tayka. 8) Stone Tree. 9) Last Lake of the Tayka. 10) Swamplands where the Occasional Herd of Llamas or Alpacas Graze. Then, the main attraction of our trip, The Salar de Uyuni. AMAZING, Unreal, Absolutely Magical. It’s an experience that’s difficult to fathom unless you travel there and experience it in person. When looking out at the salt flat, there are no buildings, no mountains, no trees or any other life form. There’s nothing between your line of vision and the horizon. The wet season just began and so our guide took us to the giant mirror while the sun was setting. We spent a good 2 hours just standing and staring at the endless expanse of salt, water and sky around us. We only left when the sun finally set and disappeared beyond the horizon. 1) The Chemical Properties of Salt create Natural Pentagons across the Entire Salt Flat when Dry. 2) 5:45 pm at 3650 Meters Above Sea Level. The Clouds Are SO Close! 3A) Sunset at 6:15pm. Absolutely Breathtaking. 4) And to Celebrate My Engagement (Haha), I'll end with a Picture of Me and My Fiance Frolicking on Nature's Giant Mirror. I highly recommend going to Uyuni before it becomes overcrowded with tourists and too developed. This was a trip that I will keep on dreaming about. The MGM Hotel and Casino in Macau is considered to be one of the most glamorous and prestigious hotels in the city. Though it can't match the new mega-casinos in size and scale, the attention to detail and the lifestyle experience that it provides its guest is unparalleled. Beyond the expansive lobby area which features a Salvador Dalí Sculpture and a ceiling sculpture done in blown-glass peonies done by American glass artist Dale Chihuly, guests enter the MGM courtyard. Built as an air-conditioned greenhouse, this courtyard was designed to mimic the atmosphere of the MGM Mansions VIP villa area at the MGM Hotel and Casino in Las Vegas. Whereas The Mansions in Vegas feature a traditional Tuscan Villa courtyard with a central bubbling water fountain and surrounding lemon trees, the courtyard at The MGM Macau pays homage to the local history of Macau. The floor is done in the traditional style of Portugal's capital, Lisbon. Paved in swirling mosaic patterns, the white limestone and black basalt stones reference the floor of Macau's main square, Senado Square. Painted azulejos (the traditional name for Portuguese tiles) adorn the facades of the surrounding walls. Around the courtyard on the ground floor are several restaurants, all with "outdoor" seating that overlook the center of the space. In the corner, an ice cream / snack stall stands proudly next to the entrance to provide children a quick cotton candy while across the courtyard, gamblers enter the main casino under the grand double-sided staircase. Gorgeous interior elements aside, what's absolutely amazing about this space are the various things and set-ups that the hotel can do with it. Every few months, hotel management puts on a new showcase or exhibition. Last year, they brought in a butterfly exhibition where guests could walk into a space and see thousands of butterflies up close. Other times, they feature art exhibitions. 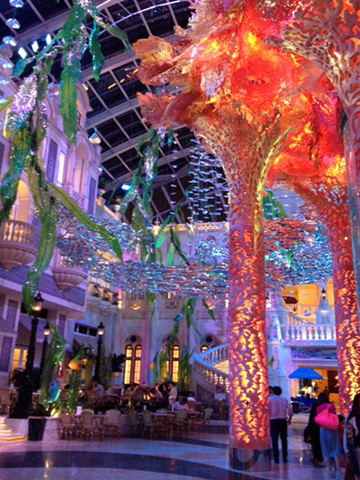 These past two months, the theme of the MGM Macau courtyard has been what I refer to as an "Underwater Fantasy". The "Underwater Fantasy" exhibition is stunning and I highly recommend that you go see it if you can. Go to one of the cafe's in the courtyard, have a coffee and just immerse yourself in this fantastical space! Macau is only an hour away from Hong Kong. Since the exhibition was still there last week, I think they won't switch it out for Halloween and hopefully not for Thanksgiving since we don't celebrate that here in Asia! Coral columns flank the 4-story aquarium while the tropical fish inside swim in schools. Warped plastic pieces are strung on fishing wire and hung to resemble rising underwater bubbles. The seaweed strands were made of cast resin (I think) and the subtle color gradients as well as the transparency of the materials give these hanging sculptures the sheen of actual seaweed. The schools of fish were made in the same material as helium balloons. Not only did this material reflect light and resemble fish scales, but it was also light enough that the structures would gently sway with the AC currents, mimicking the effect of a school of fish swimming in the sea. The term Chalet is often used to describe a wooden building or house in the Alps. These houses typically have sloping roofs with overhanging eaves; think "Heidi" from the Hollywood movie with Shirley Temple. Three years ago, I was able to go to Courchevel, France on a skiing trip. We went in February during Chinese New Year (Peak winter time in Europe) so the snow was always fresh every morning from the snowfalls at night. While we were there, we stayed on the French Side of the Alps (where we could see Mont Blanc! ), at Aman Resorts, Le Mélézin 1850. The 1850 stands for the altitude at which the hotel is located at. Le Mélézin is a Swiss Chalet that boasts ski-in service. What that means is that I can go down to the basement of the hotel, hop in my ski boots and ski right out the door without taking any other transportation! When I'm done for the day, I ski right back into the hotel doors, jump out of my boots and walk the stairs back up to my room. It was an extremely cozy hotel with only 31 rooms (of which 24 have balconies!). The main materials used in the hotel were of course wood. Darker woods for the public areas and lighter grains for the rooms and suites above. Even the ceilings were clad in wood. The suites themselves were quite simple, elegant and clean. The palette itself is inspired by the Alps outside. Primarily neutrals, greys, wood colors, with a hint of purplish blue that reminds me of the color of the shadows that the trees cast when the sun goes down. What stood out to me the most in the entire hotel was the plush beige carpet throughout the public areas. This was a surprise to me because coming from the US, carpet and snow go horribly together. From the snow and mud, the carpet gets really nasty, dirty, the fibers get stuck together, there's little bits of leaves and twigs stuck in it...and well, you get the picture. The carpet at Le Mélézin was spotless and amazingly comfortable. On another note, for the price they're charging and compared to hotels of a similar level in Asia, the bathroom fell below the bar. They used the exact same tile for the floors, wall cladding and stand-in shower. It lacked interest and reminded me of toilets in public spaces instead of a luxury hotel experience. Lastly, I'd like to finish off with a picture of another Chalet I passed by while skiing. I don't know the name of the hotel, but I've been told it used to be an old hunting lodge and the exteriors have been done in the traditional Austrian Chalet style. All the figures of the foxes, other animals and faux windows are painted on. It's so romantic! Hopefully, one day I'll return to Courchevel and see what the interior of this Chalet is like! A view of Le Mélézin from the hill above. The Dining Room where we ate breakfast every morning. The velvets used on the upholstery were a really nice touch in combination with the weather outside and the wood all around. While watching skiiers fly down the slope, grab a hot chocolate and cozy up next to the fireplaces on the terrace! The bedroom suites also boast plush clean carpets. The low ceilings give the rooms a more cozy atmosphere. Cut out windows bring in much needed light and fresh air into the suite. The living area. The view was amazing and the balcony through those glass doors overlook the main ski trail! The Austrian - style Chalet with the Painted Exterior. It feels like it belongs in a fairy tale. A Closer image of the Austrian Chalet. The exterior paintings of foxes and game birds make it's purpose as a hunting lodge quite obvious.